Usually the person telling me this story is visibly run down. Not only have they not taken a vacation, they haven’t been to the gym, they aren’t getting enough sleep…they’re clearly burning the candle at both ends. And, they’re right. This can’t last. What did your Econ 101 class teach you about supply and demand? If the demand exceeds the supply you should raise the price. The higher price will reduce demand and often bring in the same or higher revenue. Don’t believe me? Let’s do some math. Let’s say you have 10 clients at $1000 each. You are making $10,000, right? If today you raised your prices (not on the old clients, let’s just start charging new clients more) by 40%. Your new price is $1,400. How many clients would you have to have to make $10,000? If you only had 7 clients at $1,400 you’d be making $9,800. So you’d have 98% of your revenue and only 70% of of the work! You just reduced your workload by 30% and kept pretty much all your revenue! You did lose some clients — but which clients did you lose? In my experience, when you raise your prices the clients you attract are those who really need the value you offer. They are the ones who have big problems, and when you solve those problems they are so grateful, they tell everyone! The ones you lose are the clients who don’t really need you so much. They are the ones who nit-pick about everything you do, ask you for extra work, etc. So when you get rid of those three clients, you might find that you lose more like 50% of your work load (and keep all of your revenue). What else happens when you increase prices? Increasing prices doesn’t just get you more money, or more free time, it also has other benefits. When you start learning how to raise prices, it filters out those prospects who aren’t really interested in working with you, who don’t really need the services you offer. Instead it attracts the clients who need your service like a teenager needs snack food. So you get fewer clients, but the ones you do have are more committed. When we charge more, we need to focus our business development and marketing efforts. It’s harder to find those leads that are desperate for your services, so you’ll need to focus harder on your ideal customer. You’ll need to make more specific offers, and be more clear about your benefits. As a result, when you do find those ideal clients they close more quickly — you’ll spend much less time chasing prospects around. When we are getting paid more for what we do it also makes is feel differently about our services and our value. When our time is more valuable, we realize that we can afford to hire someone to do the bookkeeping; we are not so compelled to do it all ourselves. What’s stopping you? Start with your next new client! Increasing prices doesn’t have to be a big project, or take a lot of effort. In your next new business meeting just say a different number. I know one coach who increases her price with each new client. With each new client, she learns new things and gets better at what she does; so each new client pays a little more. I work with other people who do it annually. However you do it, start today. Ask your next prospect for more money. 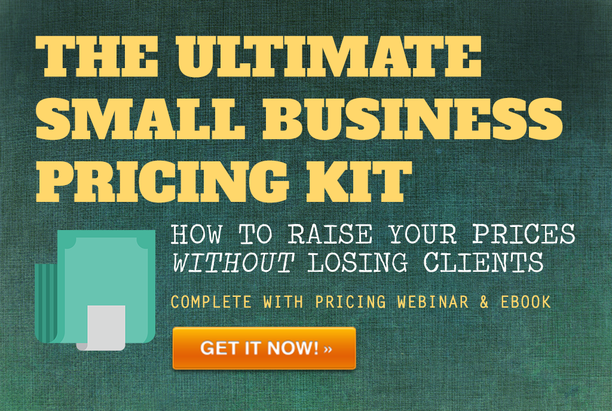 How do YOU increase your prices without losing clients? How often do you increase your prices? What has happened when you do? I raised my voice over rates in 2013 for the first time in years. I drafted a letter outlining the improvements I’ve made to my recording equipment and the investments I’ve made in my own personal development to provide better service. Most of my clients were very understanding and receptive. The ones that complained and the few that I lost were clients that honestly didn’t have that large of an impact on my business in the first place. It’s an intimidating thing to do, but it shouldn’t be. Remember, the people you’re doing business with are most likely in the same boat you are. Inflation, cost of living increases, investments in business improvement. It’s something we all deal with it and have to adjust for eventually. Congrats for getting that done. If you’re REALLY in demand Brad raise prices, make more money, with fewer clients, then you can travel all over the world with your free time. Works for me lol….smart post! Thanks Ryan. Not only does it give you more free time, but better clients too! Brad – Interesting idea. Econ 101 definitely supports this with supply and demand theory. Most business owners are reluctant to do this for fear of losing their client, but that’s what you really need to be able to manage the remaining ones properly. The danger of not doing this is to hurt your ability to service any client properly and eventually lose them all. That last comment tells the WHOLE truth. If we fail to raise our prices we can’t afford to invest (the time or the money) in improving our services and delivering real value to our clients. If we want to succeed we need to make sure we are getting paid well. Raising your price is scary to some, but it shouldn’t be. As you said, it keeps income stable, less work is required, and more time for you is available. That’s a winning formula!!!! Humans fear loss 10X more than they are attracted to gain! So the fear of possibly losing a client keeps so many folks stuck not raising their prices. Raising your prices also has to do with your profit margins. If expenses for raw materials is up or it is costing more in labor to provide your services, then you may need to consider raising prices to make sure you’re bringing in enough profit for your company. Before doing so – you should run job costing reports to see how much it costs to provide your services as well as analyze your profit margins month over month. This valuable information can help you decide if you should raise prices, and if so, by how much. Definitely recommend doing all the analysis to make sure you have the right number. I will say that most of the small business people that I work with have trouble getting their hands on those kind of reports easily. If you are actually providing a quality service/product, your customers will never leave your brand even if you increase prices. But on the same time, you can offer discounts on some special occasions on bulk buying etc. Selling in bulk will again add profits to your business. That’s true as long as you are *highly differentiated* from your competitors. If you need LeBron James you pay whatever price he asks for. But if your product is pretty much the same as the next product your in trouble!